Halloween snowstorm looks increasingly likely for the Eastern U.S.
A Halloween Snowstorm Looks Increasingly Likely for the Eastern U.S. Wipe that smirk off your face, pumpkin. The East is about to experience a case of extreme weather whiplash, as the hangover from Tuesday’s record warm high of 80 degrees in upstate New York gives way to the good possibility of temperatures below freezing in Atlanta this weekend. One of the leading analogs for the upcoming round of wintery weather is the record-breaking nor’easter that hit in early November 2012, immediately after Superstorm Sandy. But, to be fair, for every historical coastal snowstorm this weekend’s weather pattern resembles, there are at least four or five near-misses. 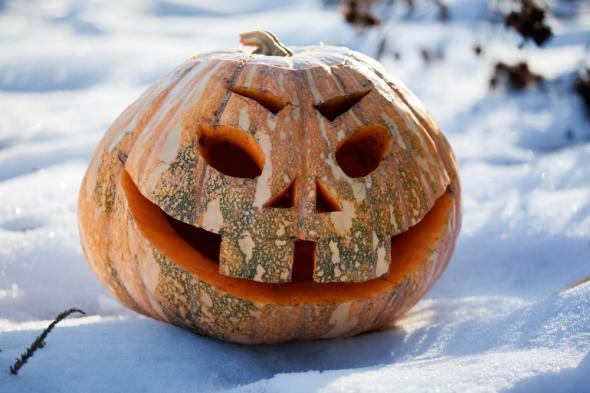 It’s still a bit too early to know exactly who’ll be dusting snow off their jack-o-lanterns. A witch’s brew of rain, wind, cold, and snow will all be possible in the Northeast/Mid-Atlantic this weekend as we start November. Temperatures will drop in the wake of the front all the way into Florida where low temperatures could approach record levels in some locations. Appreciable snowfall accumulations in the Appalachians and lee of the eastern Great Lakes into the Northeast are looking more and more likely given the strength of the amplification. The Northeast could get an early season dusting of snow on Saturday. This map shows a reasonable worst case—there’s a 95 percent chance that actual snow totals will be less than what’s shown. In Madison, Wisconsin, snow is looking increasingly likely on Halloween morning. The storm will shift east during the day and could bring a dusting to places like Chicago, Indianapolis, and Detroit during prime trick-or-treating time Friday evening. Asheville, North Carolina—a place that’s had measurable October snow only four times in the last 124 years—could also see a dusting as the calendar rolls over to November on Saturday. If snow does fall in New York City on Saturday night—and current forecasts show a rain/snow mix as close in as the suburbs—chances are it’ll just wind up being a slushy mess for a few hours. No biggie. The best chance for substantial East Coast snow is in the Appalachians, from northern Georgia to Pennsylvania. New England could also get a few inches on Sunday, though Boston will probably be stuck with a gross day of cold rain. But hey, at least they’ll have half-price Halloween candy to keep them company.